The field of organ transplantation has evolved significantly since the first edition of this book was published in 1997. What hasn’t changed is the extraordinary commitment of thousands of healthcare professionals, patients, and most importantly, donor families and loved ones who make the ultimate sacrifice in the face of a devastation loss to give the Gift of Life. These unselfish altruistic acts, which benefit dozens of potential recipients, are the cornerstones of the lifesaving benefits of organ transplantation. Many healthcare professionals as well make significant personal and professional sacrifices to support the transplant enterprise. Without their commitment, these gifts could not be received. Over 120,000 deserving patients with end-organ failure are awaiting lifesaving or life-enhancing organ transplants. Without the commitment of the multidisciplinary teams, who in some cases have given their lives to procure these organs, the enterprise cannot succeed. 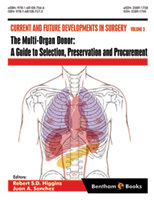 This textbook outlining the best practices in organ procurement and preservation process from world class transplant teams is dedicated to the donors and healthcare professionals who give their lives so that others could live. Special thanks to our families, including spouses, children and support staff at home, who sacrificed and supported our professional aspirations to participate in the transplant enterprise. And special thanks to Elisa Wise for her commitment to this project – which could not have come to fruition without her effort.